The view from my computer getting #archaeogaming up and running. Hi Angus! 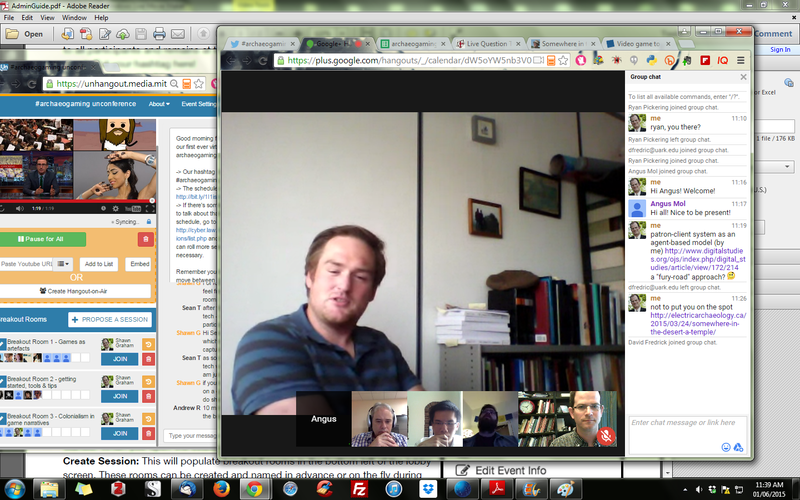 I’ll write something with a bit more substance and reflection in due course, but we’ve just ended the first ever archaeogaming virtual unconference. Time slots don’t have to be all the same length; early in the day might’ve been better to have shorter sessions, etc. Something to think about. The nearly 30* people who participated at various times during the day! I can’t thank you all enough for coming out and contributing, however you did that. *about 25 at our busiest. I’m an optimistic rounder. Most folks were grad or undergrad students I think! It was a fantastic experience! It’s always a pleasure to chat with likeminded peers…..especially without the financial cost of attending a conference. I’m in favor of more events like this. Anyway, thanks for organizing!